Robin came to the Bureau of Blind Services (BBS) to receive homemaker services after he lost his vision from glaucoma. At that time, he didn't have an employment goal because he couldn't think of any type of work that he could do. He was more interested in learning how to build the skills that he needed to be able to live independently, and complete his activities of daily living. Shortly after he started working with BBS, Robin agreed to attend the Illinois Center for Rehabilitation and Education (ICRE) to assist him with adjusting to his newly acquired visual disability. While attending ICRE Robin was able to work with staff to increase his independent living skills, orientation and mobility training, and assistance with learning how to use programs to allow him the ability to access computer systems. Robin also learned about the Business Enterprise Program for the Blind (BEPB) at ICRE and was fascinated that there was a program developed to assist individuals with visual impairments to become entrepreneurs and enabling them to run their own vending facility. Robin said that once he found out about the program he realized that he could reenter the workforce and find successful employment. Robin spoke with the staff at the BEPB and realized that he was going to need to build his skills prior to entering their program. The following year he worked closely with ICRE and the Lighthouse for the Blind in Chicago to hone his skills on assistive technology and adaptive aids that would allow him the ability to be successful in the program and run his own vending facility. Robin successfully completed the BEPB and he was awarded the Homestead rest stop on Interstate 55 near Collinsville Illinois. 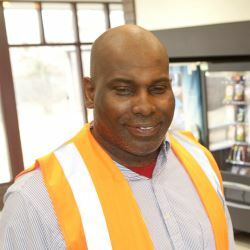 Robin is in charge of maintaining the vending machines on both sides of the interstate and is also responsible for ordering inventory, replacing inventory, keeping his own bookkeeping, and tracking his revenue for the facility. Robin also employs one person who assists him with transportation and moving merchandise. Robin informed his Rehabilitation Counselor that if it was not for the DRS Bureau of Blind Services (BBS), he doesn't feel he would have the self-esteem and confidence to be able to succeed in the workforce. He stated that there is help available for the ones who need extra support, it is hard work, but it can be done with the support of BBS. It starts off with identifying your needs and making goals, and BBS will help you reach your goals. Robin continued to say that people are more capable than they realize, they just need the support from a program like this one, and once they get connected with the Bureau of Blind Services they can be successful. DHS' Division of Rehabilitation Services is the state's lead agency serving individuals with disabilities. DRS works in partnership with people with disabilities and their families to assist them in making informed choices to achieve full community participation through employment, education, and independent living opportunities. To learn more, call 1-877-761-9780 Voice, 1-866-264-2149 TTY, (312) 957-4881 VP, or read about DRS Services. Refer yourself or someone else for services using the online Rehabilitation Services Web Referral.